>From August 2002 until June 2005 Erik lived in Stockholm, Sweden studying at the Royal College of Music in Sweden. He graduated with his Masters Degree in percussion from the Royal College of Music and received a Fulbright Scholarship in 2002 for these studies. His main teachers in Sweden were Anders Loguin of the percussion ensembles Kroumata and Glorious Percussion, Daniel Kåse, principal percussionist with the Royal Stockholm Philharmonic and Roland Johansson, former principal timpanist with the Royal Stockholm Philharmonic. Erik is co-director and percussionist with Ensemble 61, a Saint Paul-based contemporary music group and performs frequently with the Minnesota Percussion Trio and CRASH. 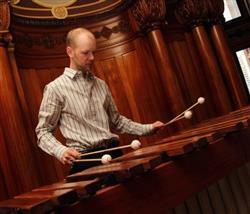 He has been a guest percussionist with the St. Paul Chamber Orchestra and has performed with the contemporary music ensemble Zeitgeist, Nautilus Music Theater, and Ten Thousand Things Theater.